Buckwheat soup with tomatoes and bell peppers. Healthy and superbly tasty. Talking about all the health food has become such a fad that we all have a fairly good knowledge of most of the healthy food around, the only problem is that we do not include those health food in our regular diet. As if just knowing is enough. Well, most of us think like this. Right ?? It is a common thinking that all the healthy ingredients are expensive and that most of them are imported. The reality is quite heartwarming. So many of the indigenous grains, vegetables, fruits and herbs are there to devour and to be proud of. Only if we stop fancying the avocados and quinoa and the artichokes and the ever so fashionable olive oil. All these imports are wonderful but if we can find locally grown less processed health produce in our own country there is no need to be in awe of these beautifully packaged and efficiently marketed imported health food produce. We grow so many healthy grains and vegetables which are still consumed in our rural areas, those healthy products are not distributed and marketed well in our country. So much so that when I was talking to a senior cardiologist some time back, he was unaware that flax seed is grown in plenty in our own country (he thought it is an imported product and that is why the flax seed oil and supplements are so costly) he was astonished to know that alsi ka laddo (a sweet meat made with flaxseeds and jaggery) is a traditional recipe. Though I was happy to know that he too thinks that mustard and sesame oils are as healthy as the olive oil. Isn't it a great respite when we are still grappling with rising prices of essential staples and healthy ingredients seem to be far from the reach of the ''aam aadmi''. The great Indian middle class. It's high time we start hunting for the forgotten treasures. Yes the healthy indigenous grains are not available off the shelf and you will find expensive jars of imported oats, muesli, couscous and polenta jostling for space at your neighborhood store. The grains that I am talking about have to be sourced from wholesale markets and from village sources. There are so many types of grains grown in our country like bajra, jowar, ragi, kulath, jau, jai, sama, kodo, tinni ka chawal, ramdana, kuttu or rajgira apart from the regular wheat, rice and corn we usually consume. Even the wheat and rice are consumed in their refined form. Right??? And tell me, do you know the names of these grains I just named? Or have seen any of them? You'll surely know them by their English names (or ask me for vernacular names) and all of these grains are available in health food stores all over the world. In our country you'll find them in some desi style grocery stores too, poor marketing to blame!!! Kuttu is the grain behind soba noodles, the grain which is not a cereal but the fruit seed. Called as Buckwheat. Interestingly it has been used for fasting food (Hindu fasting food) especially during navratri in our country for time immemorial. There are so many traditional recipes using the grain (pseudo grain) or it's flour and when I posted a savory pancake on my other blog, I received some queries regarding this grain and here I am. I did not find this grain anywhere in Delhi, though the flour was available during the navratri. Fortunately I had to visit Kanpur for a day and found it there. 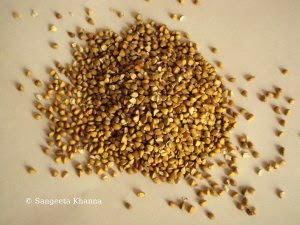 I found both the groats (called kuttu ka daliya) as well as the whole grains with skin. 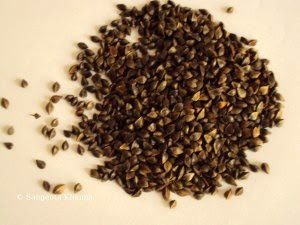 Groats or the kuttu ka daliya can be used for cooking but the whole seeds are used to make the flour as I was told. But I think grinding the groats at home is the best way to make fresh flour as it is a soft grain and powders easily. Buckwheat is called the king of healing grains because it is a great prebiotic food, a gluten free grain and is rich in manganese, tryptophan, magnesium and dietary fiber. It is rich in flavonoids, particularly rutin. Flavonoids are phytonutrients which protect against diseases by extending the action of Vit. C and acting as antioxidants. The nutrition facts of buckwheat are here...it is not a low calorie grain as one serving of a cup (164 g) contains 567 Calories but when it cooked with vegetables each serving has about half this amount and it can be a great weight loss food. 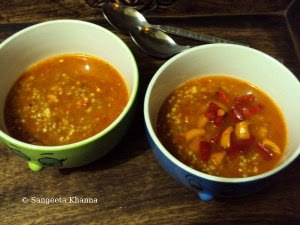 The soup recipe which I am posting here contains just a tbsp of raw buckwheat per serving. It expands a lot after cooking. Also, it is a low GI food (Glycemic index is 54) and it is suitable for weight watchers for obvious reasons. I made a simple soup with buckwheat groats after writing the above information for this post and it was such a yummy yet light dinner for the two of us, very very flavorful. Talking about a healthy ingredient always inspires me to cook healthy. Does it have the same effect on you ? 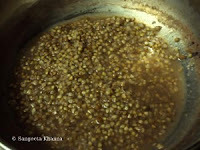 Dry roast the buckwheat groats in a skillet (this is optional but I recommend as it improves the flavor). Add 500 ml water and salt to taste and boil till cooked. It needs occasional stirring on low heat. This is how it looks after cooking, the water is reduced a bit. 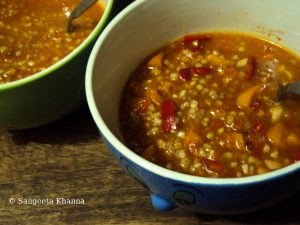 I like the buckwheat remaining whole n completely softened after cooking as it gives a nice bite, you can cook more if you like it mushy and pulpy. 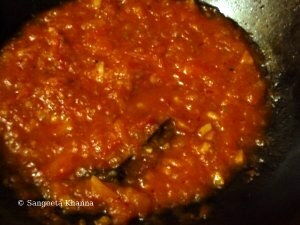 Meanwhile chop the garlic finely and make a raw puree of tomatoes in food processor. Heat butter in another pan and throw in the cinnamon and garlic and fry till the garlic is pink. 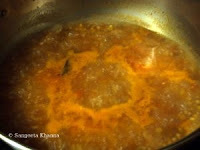 Add red chili powder into the pan, stir and immediately pour the raw tomato puree and salt (cooked buckwheat has salt too so be careful) and sugar and cook till the tomato sauce thickens and becomes smooth . You can use tomato concasse or marinara sauce to make this soup too. Pour onto the cooked buckwheat and add some water (depending on how thick a soup you want) and give it a boil. The soup is ready with all it's simplicity. Bursting with flavors of garlic and tomatoes. Just the way I like it. Basil is a great addition to this soup but I didn't add it this time as it has been a basil overdose in the past couple of days for me. This soup has prominent flavors of garlic and tomatoes and I like it hot with red chilies, you can adjust the simple seasonings according to your taste and this soup accommodates any kind of herbs very well. Try it with soba noodles if you don't find any buckwheat groats in your part of the world. Also, if you avoid garlic and use Himalayan pink salt (sendha namak) instead of table salt in this recipe, it can be had during Navaratri fasting too. 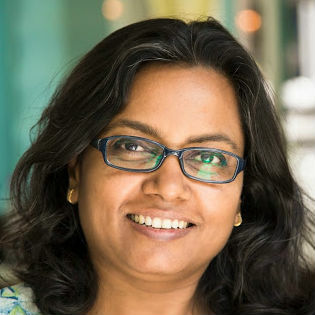 Hi Sangeeta thanks for visiting my blog and giving a nice comment.U r always welcome to my blog.You too have a nice blog and I shall also visit u often. Thanks for visiting my blog after a long time and for your lovely comment. I liked the preparation of the soup. Very nice and interesting recipe. Soup looks yummy, spicy and creamy. Wonderful presentation. so true, while rushing behind the latest and greatest in health food trends we somehow forget to nurture our traditional health foods grown in our own backyards. Buckwheat soup looks delicious.. I have never cooked with buckwheat in the groats form, but seeing your post now, I so want to, if only I can find it..
Typing again..don't know if the first comment went through..
Lovely dish with Buckwheat. Love any dish made with any form of wheat.Recently I tried "Turkish Tabbouleh" with Bulgur. Check it out when you have time. You might find it to your liking! this looks so delicious and healthy too..great way to make soup like this and so so tasty..very comforting and something that doesn't cost us a lot but pays back great in health.. This is beautiful. Your reminder that local foods are often just as good, plentiful. flavorful and delicious are well noted. my heart jumped with joy when I saw your post in my dashboard. am on leave so missed your last 2 posts...Welcome back Dear. this is a wonderful informative write up. the soup looks creamy and mouth watering but not sure if we get these in b'lr or Kolkata. i believe in divine connections . you really delight me...thanks . movies in a theater was out of question for me for several years so i watched only on HBO and Star movies ( on TV of course ) .... now that you recommend i'll not wait for it on TV n get a DVD instead. It will give me a much needed positive boost i am sure n thanks for that..
Good to know that you started adding garlic to your food...it is such a great antioxidant besides helping fight with infections and of course high BP .......a tea spoon of butter is good with garlic n all that tomatoes , how else will you get the goodness of lycopene which is only fat soluble n you know butter is good ......only if don't overindulge. 1 tsp of butter to make 2 servings of soup gives you guilt pangs......pagli !! Awesome. Shall try to replicate at home after haunting my organic guys for this. Apparently things like amaranth are grown in villages, the cities don't demand as much, so we rarely see these in the regular grocery stores. One store told me - take this, this is gram flour....it is the same as ramdaana!! We get mos of the grains in Delhi thankfully. Amaranth grains are also caled Ramdaana in Hindi, the Ramdaana ka laddoo is quite easily available here , though in some shops only. This is such a good tasting soup and so easy and quick to make. Thanks Sangeeta for another wonderful recipe. I added 2-3 tsp of yogurt and topped with 2-3 pita chips, Yummy :) While Boiling the buckwheat groats, there was froth ( i boiled without salt) , did not discard it. Is that normal Sangeeta? kodo is a millet (botanical name Paspalum scrobiculatum) whose English name is kodo millet too. Yes Navdanya stocks almost everything and I love getting all these millets and alternative grains there. Thanks for the info. I am so glad you liked the soup.